Many people use the PowerPoint application, from the Microsoft Office suite, whether to create presentations with photos or to create a presentation for a larger project, the problem can arise when you try to open these presentations on a computer that doesn't have the program installed. To be able to avoid this kind of situations you can use PPT to EXE, and transform a file that can only be opened by PowerPoint and other compatible applications into an executable file that can be launched on any computer that uses the Windows operating system. 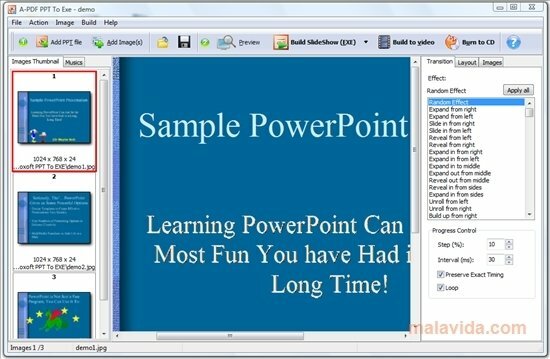 As well as converting existing PPT files to executable files, PPT to EXE allows you to select images to create a presentation from scratch, as well as offering you the possibility to add audio to a presentation. On the other hand, PPT to EXE also allows you to export the PPT files like video files or burn them directly on a blank CD or DVD. Therefore, if you want an application that will help you to be able to make your presentations visible on any computer, download and install PPT to EXE. This application requires GhostScript and offers you to download a free version if you don't have it installed on your computer. The trial version only allows you to add three slides to each presentation.